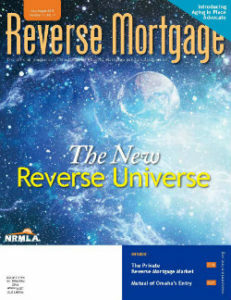 The July/August issue of NRMLA’s award-winning publication, Reverse Mortgage magazine, addresses two significant developments – the emergence of a private sector reverse mortgage market, and Mutual of Omaha Bank’s entry into the reverse mortgage business. Guest writer Jessica Guerin surveyed the industry to learn about new proprietary products either on the market or on the way, and provides an update on them all. Guerin also looks at who is likely to take advantage of private-market loans. Staff writer Mark Olshaker interviewed industry observers and executives for their perspectives of Mutual of Omaha’s new acquisition of Synergy One Lending and its reverse mortgage division, Retirement Funding Solutions.